Many Steam games provide you with an additional activation key once they have been downloaded on a Steam account. 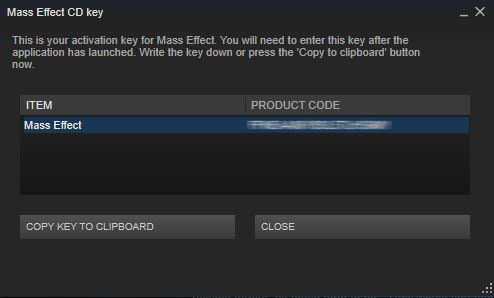 These keys appear in the Steam library when you right-click the game and select 'View CD Key'. These keys are used to register your product outside of Steam, with a third party client or service. This FAQ pertains to Steam-issued keys that were added to your account after a game was purchased or registered. If you are registering a retail or digital key to your Steam account, please see the Retail & Digital CD Keys FAQ for further information. Why am I not receiving my Steam-issued third party key? Make sure that the game has been successfully downloaded and installed through the Steam client. A key will not be issued on the Steam account until the download has begun. If the key is still not generating, please verify the game cache files and restart the Steam client. Why am I receiving an Invalid Key error when attempting to register my key? If you receive an invalid or duplicate error when registering Steam issued key, you will need to contact the respective support department for that service. Steam does not have access to third-party registration systems and cannot resolve issues with registration. Make sure to provide them with your Steam-issued CD Key, Steam account name, and email address, so that they can better assist you.